More fabric to die for……. 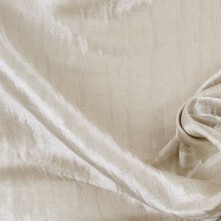 I was sold upon reading Mood Fabrics’ narrative of this silk/viscose blend and placed it in my online cart. The fabric didn’t disappoint ~ actually I want more! The backing on the fabric produces the perfect texture for machine sewing. I’m devoted to sewing holiday attire for the next few weeks and couldn’t pass up the giant bow on Butterick 5850! The silk/viscose worked beautifully with the pattern in every aspect. The gathered skirt is attached to a fitted back. I typically shy away from gathered waistlines, but I wanted that bow! The sash cinches the waist, helping camouflage the bulk that gathers can produce, and I found the fitted back flattering. Hmmm…… I think this dress needs a fur…. Anyone sewn with faux fur?